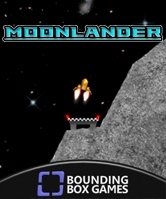 MoonLander for the XBox 360 is available now! MoonLander for XBox 360 has passed peer review and is available now on the XBox Live Marketplace! If you have an XBox Live account, you can have your PC set up the download by visiting the XBox marketplace website. There's also a control for rating the game there is you would like to help us out with the ratings. Thanks!